Have you set a New Year’s resolution to get out more? Would you like to meet new people and have a chat? 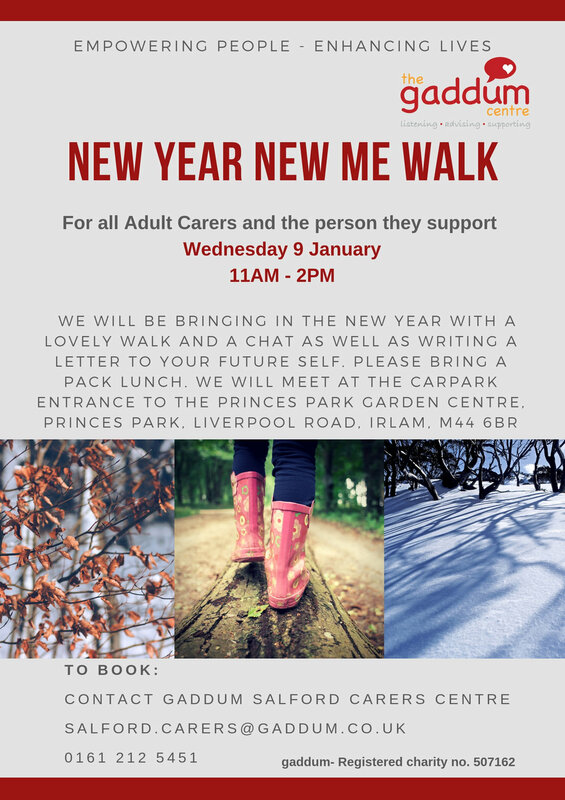 We’re inviting adult carers and the people they support to attend our New Year New Me walk in Princes Park on Wednesday 9 January. We’ll be meeting by the car park entrance to the Princes Park Garden centre in Irlam ready to set out for 11am. To book on, call 0161 212 5451 or email us at salford.carers@gaddum.co.uk. It will be a lovely, relaxing walk with a chance to write a letter to your future self if you wish. Don’t forget your packed lunch!